I have yet to meet a writer who isn’t a library lover. How could a writer not be enchanted by an institution dedicated to the very object writers seek to create? My first impression when I enter a library is almost always auditory. The absence of noise is magnetic for me. Oh, there is the gentle din of a whisper followed by a hush now and then. But the silence sends a rush of equanimity throughout my body that is akin to when I am on a yoga mat. My next sensation is olfactory. I do not know how some people claim they can’t smell books. To those of us who can, the library filled with books is like an abundant spring garden flush with long awaited peonies and roses. It’s one of the many reasons people stick with print editions of books. The library is a writer’s haven. The setting is perfect. There are tables and chairs, some even cushioned. No one will tug on your sleeve and ask if you’ve seen their jeans they put in the laundry. No one will say there’s an important call on line two you have to take. No one will even tell you to get writing. That part’s up to you. You will be surrounded by people who respect the written word and are grateful to those who put pen to paper. And there are books on countless topics spilling from bookshelves, floor to ceiling. Be still my heart. I am blessed to live near many wonderful libraries on outer Cape Cod. Because I view writing as not just what I love to do, but also as my job, I take to the road several days a week to write in a library. I learned long ago when I was in law school while raising a family with three children the importance of having a spot exclusively designated to do work. Back then, my husband would pack brown paper bags for the kids and me filled with sandwiches on pumpernickel bread, pickles, and cookies for desert. I’d get a tall ancient Stanley Works metal thermos filled with black coffee. I’d head to the law library where I would lock my self away in a cubby for hours. These days, I pack a lunch, place it in a cooler, and set off for the library that is calling me and open that day. The first thing I do is find a spot that calls to me. Place is as important to me as it is in my books. I have to feel connected to the spot I will call my own, even if it is shared by the public. Next I wander around just to get the sense of the library. I always wander to the mystery section to see if my books are on the shelves. I never fail to be touched by the sight of No Virgin Island or Permanent Sunset sitting next to a long row of books written by some guy named Tim Dorsey. I return to my spot and settle down. I read what I’ve already written, feeling totally comfortable shaking my head in consternation that I haven’t hit the mark. No one around me cares what I’m doing. Once I begin writing, I may stare at the ceiling hoping it holds the word I’m searching for. Again, no one cares. The Eastham Library is spanking new and a writer’s nirvana. Expansive windows overlooking a pond where birds flock, there is no shortage of natural light to bring enlightenment. And it doesn’t hurt that it has a fireplace. The Provincetown Library is newly renovated and has managed to preserve an historical flavor yet provide modern conveniences. 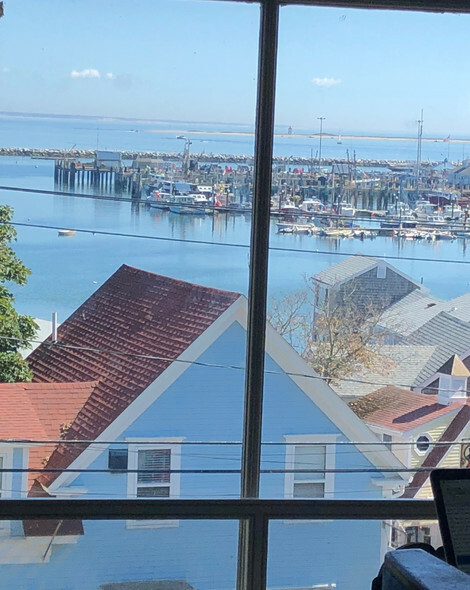 If a writer can’t be inspired by the third floor view of Provincetown Harbor, I don’t know where she will. Orleans, Wellfleet, and Truro also boast beautiful welcoming libraries. The Brewster Ladies’ Library is a magnificent historical restoration and has the neatest name. When the weather is warm, I often write in a shed I call my writing sanctuary. But even in the heat of summer, I am drawn to libraries to find that spot that resonates with me and is my haven for writing. How about you? Have you a favorite library where you like to write?